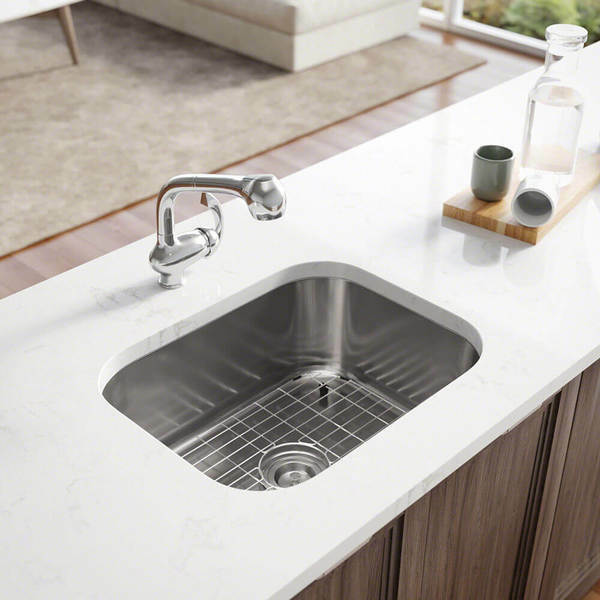 A moderate-sized, undermount sink with broadly-curved corners and a centerset drain. The R1-1018 is constructed from a single sheet of the highest-quality 304 steel and is available in 18- or 16-gauge. Overall it measures 23 x 17 3/4' x 9 1/4. It will not rust or stain, features an alluring brushed satin finish, is insulated, quiet, and guaranteed by a limited lifetime warranty. Template and mounting hardware is included. Included is a fine-grained cutting board, custom-made to fit this basin. Created from the rubberwood tree, a natural hardwood, it is naturally mold and moisture resistant. Additionally, a groove along its perimeter channels away any runoff. To protect the sink surface from scratches or dents, one superior-quality, custom-fitted, stainless steel grid is included. Its removable rubber feet raise it slightly above the bottom of the sink. The included basket strainer is capable of holding much more waste than common models. Its roomy interior is perforated and can be removed with its own handle.